Gyroscope is a tool to measure and stabilize angular velocity. In the Gyroscope a spinning wheel is used which is free to move and assume any axis. This happens because of conservation of angular momentum. Due to angular momentum, the wheel constantly moves unless any external affect is applied. Gyroscope is used in many Places to maintain and guide rotation. In the recent technological development there are other types of gyroscope has invented which works on other principles. the electronic, fiber optical etc are the modern types of gyroscope that are being used. When a wheel rotates about an axis, the change in its orientation i.e. The angular shift in the axis of rotation is called precession. This angular shift can be determined as the axis of rotation is itself rotating about the axis of precession. the change in orientation happens when an external force is applied to the gyroscope. The wheel will precess in the direction perpendicular to the direction at which force is applied. When a wheel or disc is rotated or spin with a torque about an axis and with an angular velocity, a centrifugal force reacts on the system. this force create a reactive torque which has another axis perpendicular to the axis in which the disc is rotating. Due to this the axis of rotation will precess or turn at an angle. the turning of the wheel depends on its direction of rotation whether it is clockwise or anticlockwise. 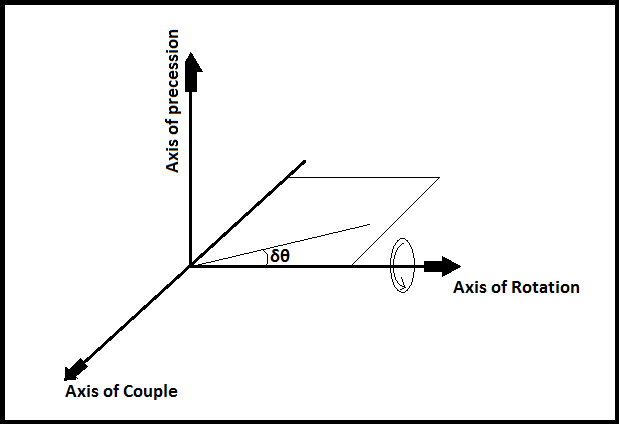 if the wheel rotate about axis OX at anticlockwise direction, the couple will act at the axis of couple. due to this couple the the wheel will move along the plane of precession with an angle. the plane of precession will be perpendicular to the axis of precession.